The Exploratorium in San Francisco is hosting a unique musical event in conjunction with the total solar eclipse. 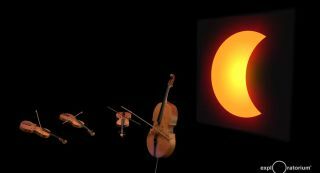 The Aug. 21 total solar eclipse will have some musical accompaniment at the Exploratorium science museum in San Francisco, featuring the acclaimed Kronos Quartet. The museum will host the quartet, which will play a musical composition around totality — the period when the moon totally occults the sun. But the full eclipse composition will also include live music created digitally from a live feed of the eclipse. If you can't see the event on-site, the Exploratorium will livestream the event. The "real-time eclipse sonification" is being produced by Wayne Grim, a Bay Area composer and a sound artist at the Exploratorium, in collaboration with the Kronos Quartet, according to a statement from the museum. Grim's composition is called "233rd Day," a reference to Aug. 21 being the 233rd day of the year. "To create the soundscape, Grim will process digital information collected from an array of telescopes and translate that information into an auditory experience," museum officials said in the statement. "The Exploratorium will stream feeds of the eclipse over Casper [Wyoming] from four different telescopes using two different filters," Exploratorium officials said in a statement. "When the telescope feeds switch, the digital information coming in causes the tonal range of the sound to change as well; to hear the music leap and stabilize with each feed transition allows for a piece of music that is not only responsive, but dynamic and fascinating to hear," the statement said. "Grim also incorporates algorithms based on the movement of the planets visible during the dark sky of totality to create the sonification." Grim has produced compositions for live celestial events before, including the 2012 transit of Venus and a 2016 total solar eclipse that the Exploratorium broadcast from Micronesia. "The experience of translating astronomical events into music is profound," Grim said. "You get a chance to listen to light, to understand the relationship between the sun, the moon, and the Earth in a new way. I'm elated to have a chance to collaborate with the stars on this piece — I've been a fan of Kronos Quartet since I first heard [their 1990 album] Black Angels, and I’ve been a fan of the sun for literally as long as I've been alive." The live performance will begin at 9:15 a.m. PDT (12:15 p.m. EDT, 4:45 p.m. GMT) and last for three hours. Kronos Quartet will join in at 10:30 a.m. PDT (1:30 p.m. EDT, 5:30 p.m. UTC) and will play for a total of 30 minutes before, during and after totality. All of Exploratorium's livestreams are on its app, which is available from both Google Play and Apple's App Store. You can get more information about the app on the museum's website.